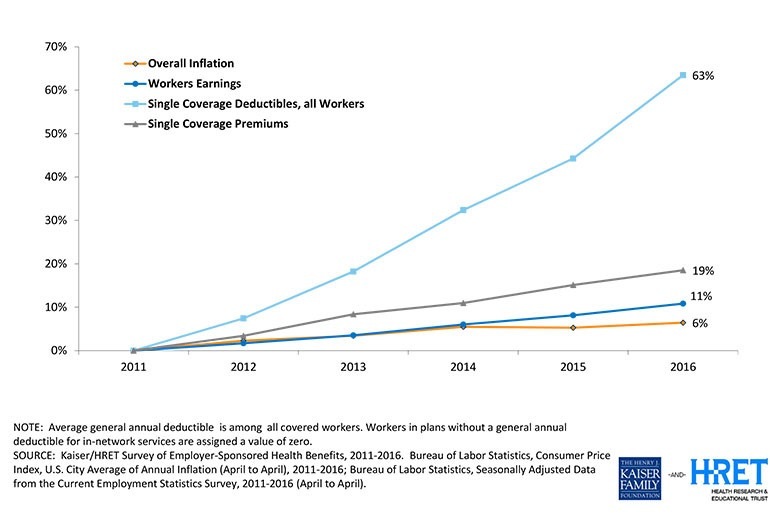 Any doubt workers are on the hook for more health care costs? What’s really hard to tell is how the average patient knows the difference😷 How many needless tests and procedures has your doctor ordered? These plans make people think twice about generic drugs versus brand, and maybe an office visit or two, but not much more. Employers are saving money because they are not paying the first $1,000 to $5,000 or more of the expenses a family incurs. And, or course, that is reflected in premiums. When I started working in corporate employee benefits in 1961 the medical plan had no coverage for services not provided in the hospital in-patient or out. And those services were provided on a fixed fee basis. $150 was the physician’s allowance for delivery a baby. Office visits, most test and lab work beyond $25 a year, all prescriptions, physical thereaby and more were the patients responsible. And guess what, you rarely heard the word “unaffordable.” As soon as patients became less and less concerned about the cost, things became unaffordable. Funny thing about that. Today, most people pay less out of pocket, adjusted for inflation, than they did 40+ years ago. If not the individual, who should pay? Taxpayers, Mexico, perhaps France? Who pays for your auto insurance, food, etc. Tell that to my friends who pay $1,000 a month in premium with a $10,000 deductible. I am 63 and have been covered by high deductible plans since 2006; I have not seen a doctor for anything during that time because I don’t want to pay the out of pocket deductible. Deciding what tests are needless, and who decides, is a interesting question. In the Government run health care system in Canada, routine PSA screening for prostate cancer is not recommended by the health care authority there. (I looked that up yesterday.) Here in the U.S., Medicare will pay for PSA blood testing for all covered patients over 50 years of age. Very recently a close relative was diagnosed with prostate cancer. Biopsy confirmed it, but a high PSA score was the initial indicator. He had no symptoms.